I have been super busy with family commitments and haven't had an opportunity to create a card for ages. I was very happy to get back into it creating this card for the latest Less Is More Challenge - Polka Dots. I will also put this in the WMC Challenge #73, free for all. I love your understated, elegant card Tracy! I'm sure you're glad to get back to crafting - I get withdrawal symptoms if I miss a day! This looks so simple but also completely stylish. Every element works perfectly together. I particularly love the way you have layered the white on the Kraft. Very elegant. I love the design! 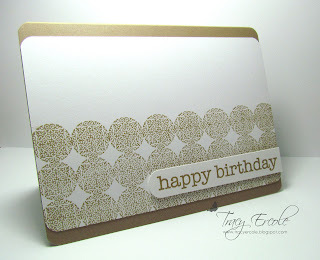 A fabulously classy way to do dots!